When I arrived for my pastoral internship in Mater Dolorosa Parish, some members of the youth informed me about pilgrimage of the Cross they have every Lenten season. They invited me to journey with them this year, which I accepted without any hesitation. 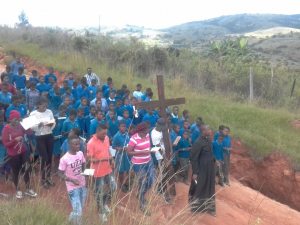 All the outstations and schools have the privilege of contemplating the cross, praying the rosary and the Stations of the Cross. The Priests and the Mantellate sisters also join the pilgrims. Thursdays and Saturdays are set apart for the pilgrimage. This year we began at Maryward Primary school on the Thursday after Ash Wednesday where the students and teachers received the ashes and we prayed the way of the cross together. 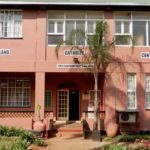 Our second pilgrimage was to St Manettus Primary School (Malanti). 2 km before we reached the school, the students, teachers, and some few community members were eagerly waiting for us. We prayed the sorrowful mysteries together, taking turns in carrying the cross. 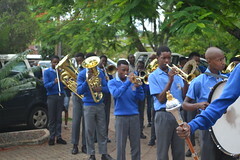 This was followed by nice Lenten hymns and choruses by the students as we walked down the hills of Malanti. At the school we prayed the Way of the Cross together and then I gave a small reflection on the meaning of lent in the life of primary school kid. Afterwards they received the ashes. I asked some of the senior students about their experience of the pilgrimage of the Cross and the Lenten season. The answers were almost similar because they all pointed out that, it is a time of remembering that Christ died for them. In return to that they help the poor through their Lenten collections done in their classrooms. They also pointed out that every year they look forward to this period of contemplating the Cross. We are still going to the following communities: 16 March Mpolonjeni, 21 March All Saints (Siphocosini), 23 March Motjane, 30 March Nkhaba, 4 April MDS Primary and 6 April Bhunya.